The house was an empty unfurnished cozy space (except for white goods) when we moved in but we’ve been so lucky that things have been flowing towards us from my very large heart family here in Southampton. The lounge went from an empty space to a furnished Moroccan themed lounge in a matter of days and is now completely furnished with love without us having to buy hardly anything. The bedroom has no bed but one is coming to us at the end of the month from a friend and I am just over the moon. The universe is being ever so generous and gracious towards us that I am just speechless, in awe and soooo humbled. Thank you universe, thank you God :-). So now, i’m back, again. Relaxed, 18 weeks pregnant, energised, happy, surrounded by awesomeness and ready to rock and roll!!. 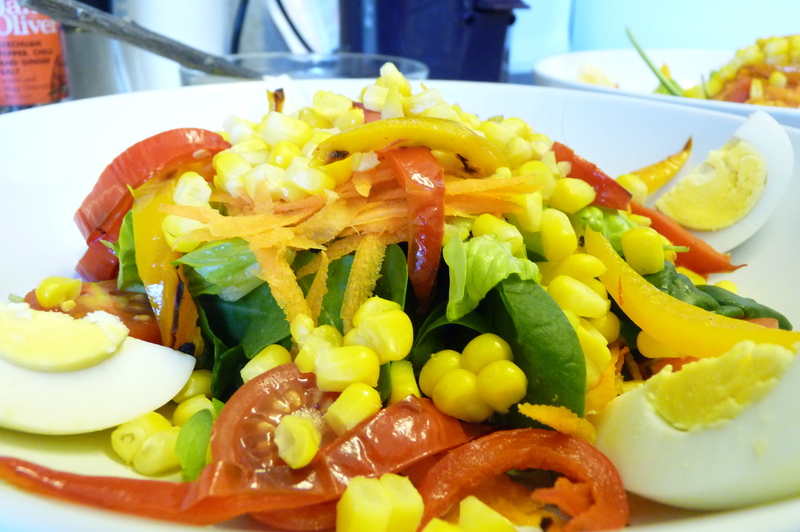 So many food related plans going through my head at the moment but lets start with a bit o’ sunshine shall we?…..Sunshine salad.